Standard sizes or designed and built to order. Up to 8m span & 8m high. From 500kg to 20t capacity. We can design, manufacture and supply mobile and A frame gantries or build to your specifications. 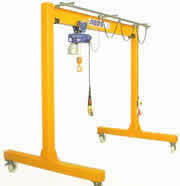 We are able to repair, service and test all types of gantry in our workshop. Please contact our sales staff for further information.